WILL THE MARKET'S BULL RUN CONTINUE? How long will this bull run last? I spent fifteen years as a Global Investment Strategist and a Hedge Fund manager. Those long, fourteen hour days, pouring over copious amounts of data from dozens of asset classes and over twenty different markets will teach even a poor student like me a thing or two about investing and how markets behave. I want to share the lessons I learned in the context of the Indian market. The first lesson was never to confuse a bull market with brilliance. Many of us thought we were investment gurus during the dot-com bull market in the US in the nineties. We had spectacular successes buying internet companies like Yahoo, Amazon, AOL whose stock prices were doubling every two weeks. But even a monkey could have made money by buying those stocks. Similar exuberance was experienced by real estate investors in India during the housing boom of the 2000’s. Everybody became a real estate genius in a market where prices were doubling every year. These “bull market successes” lead to what is known as ‘attribution bias’ which is an inflated confidence in one’s skills. This attribution bias, which leads to hubris, is the biggest reason why people lose money. This misplaced confidence in their ability to beat the market predisposes them to sell winners early and hold on to losers longer than they should. It’s this attribution bias that separates a speculator from a professional investor. A speculator falls in love with his ability to pick winners. For him beating the market becomes an ego thing. When he loses, he laments that he should have sold the stock earlier or held on to it longer. But there is always an attachment to the stock, and never to the processes that led to the gain or loss. Speculators lack an underlying trading philosophy and are always chasing hot ideas. They do well when the market moves in one direction for an extended period, i.e., when there is momentum in the market, but in volatile markets, they get hammered. The vast majority–more than 95% –of players in the market are speculators. Professional investors, on the other hand, don’t use the market as a tool to inflate their ego. They practice the Buddhist philosophy of detachment–being completely removed emotionally from their winners and losers. Investing, for them, is a game of Mathematics, of keeping score of where they stand financially at any given time relative to their goals. Buy and sell decisions are based impassionately on goals being achieved and not on hunches or gut feeling. The best professional investors probably couldn’t tell you which stocks they made money on because they keep track not of names, but of processes and linkages. What was my thinking when I bought this stock? What information led me to invest in this stock? Which pieces of information lead to right decisions and which ones to poor decisions? At my Hedge Fund, no day was complete without all the traders and analysts getting together to write down reasons for every trade made–and we made several hundred trades a day. But everyone who worked there would tell you that was the best part of the day because that’s where the real learning happened. I would urge everyone who is serious about investing to keep a similar record of all their trades. It’s an invaluable tool. Detached thinking allows professional investors to develop a consistent and principled basis for their trading. Professional investors never fall in love with an investment. When they reach their targets of profit and loss they close out their position–there is absolutely no ego or attachment to the success or failure of their idea. If there is a loss a professional investor never laments the poor decision. Speculators, on the other hand, hold on to a losing position in the hope that it will eventually turn around and they would be proven right. This is where the large losses occur. In the stock market, the gains almost always happen in small incremental steps, but losses happen suddenly and sharply. Just examine a stock price chart: you will notice that an upward trend is gradual–almost like climbing steps–but when the price comes down the decline is sharp, quick and steep. Which brings me to the second lesson I learned early in my career: the need to manage downside risk. Most people who invest in the market have lots of small victories until a large loss wipes them out. So follow what most good hedge fund managers do: always ‘hedge’ your bets, so that when things don’t work out you don’t get wiped out. Hedging is like buying an insurance policy–it’s redundant, and a waste of money until you need it. Professional investors know that the market can be ruthless and it’s prudent to have some insurance against the three or four sigma events which have destroyed many investors. So, if you are an active buyer of stocks buy an index put to cover yourself against a sudden market decline. If you are short the market, hedge your position by buying some call options. If you are long Coke, hedge that by shorting a few Pepsi futures contracts. Professional investors always have a list of correlated assets that they use to hedge heir current positions. Yes, hedging, like buying an insurance policy, does cost money and this will reduce returns, but trust me, it is well worth it. The third and probably the most important lesson learned was to never ‘fight the market’. You can buy the best stock at the wrong time, and you will lose money, and you can buy the worst stock at the right time, and you will make money. When to buy and what to buy can only be learned through a process of detached evaluation. A professional investor knows how to feel the market. Most speculators watch the price, but professional investors pay close attention to changes in variables like the bid-ask spreads, trading volume, put/call volume, ask-volume, bid-volume, money flow into the market, etc. to get a pulse of the market. Let’s now evaluate the Indian stock market from the perspective of a professional trader. We will examine the fundamentals of the market, and try to get a “feel” for the market. Let’s start by asking the question–what moves stock prices? When you buy stock, you are essentially buying part of a company. You become part owner of that company and are entitled to a prorated share of its earnings. So, on a fundamental level, the stock price of a company is related to its expected earnings. Every Finance student knows that the price of an asset is the present value of the cash flows expected from the asset. Stocks are no different. So, the price of a company’s stock is the present value of its expected earnings. The higher the future expected earnings of a company, the greater the price people would be willing to pay for its stock. The empirical evidence on this is very clear. In the long run, stock prices are related to only one variable: expected earnings. Notice I said expected and not actual earnings because the market is always forward- looking forward. Stock prices are related not to present or past earnings but to earnings ‘expected’ in the future. That’s where the professional investor separates himself from a speculator. He puts on his Warren Buffet hat and asks whether he would want to buy the company ( we will talk about price later). “Is this the right industry and is this the right company?” Will the company’s earnings grow in the future? Does the company have the products that will allow earnings to grow? Does the company have a moat, a USP, or high barriers to entry to keep competitors away? All these questions are designed to answer one question: what would expected earnings be? Warren Buffet has a very simple analogy for this. He likens stocks prices to the prices of hamburgers, his favorite food. How true. Everyone likes it when stock prices are going up and not when they go down. Except for the professional investor. He loves it when prices decline so he can pick up earnings on the cheap. Professional investors don’t care if they get Rs.1 of earnings from company A or company B. What they care about is how much they have to pay for those earnings, in other words, the price-to-earnings ( P/E) ratio. So if a company’s stock has a P/E ratio of say 8 –think of this as 8/1–it means that one is paying Rs. 8 to get Rs.1 of earnings. So if you were deciding between the stock of two company’s, one with a P/E ratio of 8 and another with a P/E of 16 which one would you buy? It depends if you were a professional investor or speculator. The investor would buy the lower P/E ratio stock because he has to pay less ( Rs. 8 versus Rs. 16) to get Rs.1 in earnings. The speculator, on the other hand, will buy the higher P/E stock because he prefers buying stocks whose prices have gone up. The empirical evidence shows why professional investors do better than speculators. 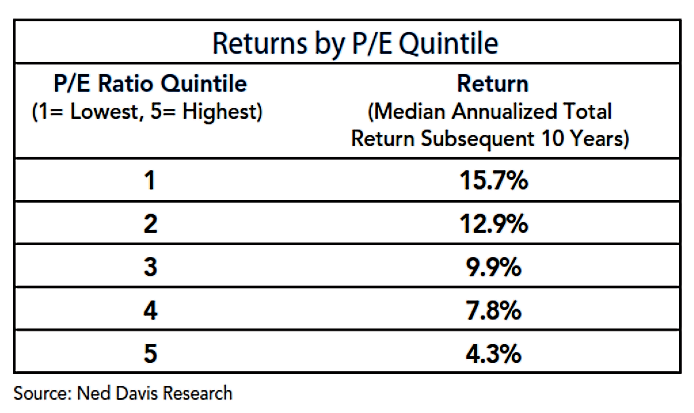 The table below shows that investing in stocks with low P/E ratios provide almost four times higher returns in the subsequent ten years than stocks with high P/E ratios. This is what Buffett meant by his hamburgers analogy. 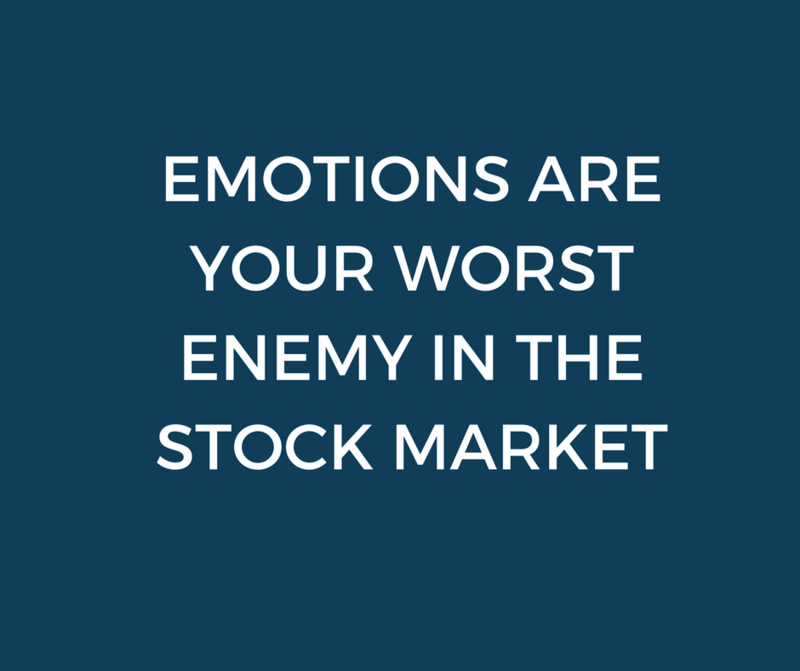 Get excited when stock prices are low, not high. Conclusion: Professional investors get excited when stock prices are low. Speculators, on the other hand, buy stocks when their prices are rising. To bring this to the context of the Indian stock market. The 20-year average P/E multiple of the Indian stock market is 15. This would suggest that anything above 15 would be relatively expensive. Currently, the P/E ratio of the Indian stock market is close to 25 putting it in the highest ( 5th ) quintile in that chart above. Would a professional investor be buying stocks in the Indian market today? Based on the fundamentals he wouldn’t, but other factors also come into play. Let’s examine a few of those to get a “ feel” for the Indian stock market. Prices of stocks, like every other commodity, are also affected by demand and supply–something called liquidity. In other words, the amount of money coming into the market affects the demand for stocks, as do things like new listings that affect the supply of stocks. Foreign institutional money is hot money that chases returns worldwide. It’s called hot money because it comes and disappears quickly. In my Hedge Fund, we didn’t care where the opportunities existed: whether they were in Singapore, China, Hong Kong or the USA. Our job was to find those opportunities and make money on them. Once our objective was achieved we were out of the market. Currently, foreign investors find the Indian stock market attractive because there aren’t many alternative investment opportunities available. Global yields on fixed income securities are stuck at around two percent, commodities have been in a slump, and volatility in the currency markets is near an all-time low. As a result, a lot of foreign money is being invested in the Indian stock market. Over the last ten years, almost 6.5 lakh crores ( $ 100 billion) of net foreign investment has come into the Indian stock market. In fact, the value of Indian stocks owned by foreign investors today is twice that owned by all domestic institutional investors (mutual funds, insurance companies, banks ) put together. This is a scary aspect of the Indian stock market. A significant amount of the liquidity in the market–which is propping stock prices up–is hot money that can disappear at the first sign of trouble. If this liquidity were to get pulled out of the market Indian stocks would plunge in a big way. And this could happen if the rupee weakens ( making the foreign investor’s Indian rupee returns less attractive in dollar terms ) or the NPA crisis becomes a full-blown banking crisis. What is even more troubling is that the availability of stocks has not gone up despite the increase in demand. Many of India’s big businesses are still majority family owned ( Tata’s, Ambani’s, Mahendra’s, Adani’s, Munjal’s, etc.). In fact, 51% of all stocks outstanding are owned by families and promoters and these stocks are not openly available for sale. This means that only about 49% of the stocks outstanding are marketable (called free float). What would happen to the price of apples, for example, if lots of people with money show up in the market to buy apples, but only 49% of the outstanding stock was available for sale? It would increase the price of apples. Similarly, all this foreign money coming into the Indian stock market combined with restricted supply puts upward pressure on stock prices. This lack of supply explains in part why the Indian stock market has such a high P/E multiple. More than 75% of the daily trading on the Bombay Stock Exchange (BSE) is in the stocks of only 100 companies. And to compound this supply problem further, there have been very few new listings over the last four years on the Indian stock exchanges. The combined value of Initial Public Offerings ( IPO’s) on Indian exchanges from 2011-2015 was Rs. 16,000 crores ( $ 2.5 billion) which was half that in 2010 alone (Rs.33,000 crores or $ 5 billion). In comparison over $ 200 billion of new company stock listed on the New York Stock Exchange during the 2011-2015 period. It is easy to see from these liquidity numbers why Indian stock prices may be higher than would be justified by fundamentals. Demand from foreign institutional investors is high while supply is low because of low levels of free float and the lack of new equity issues. Another factor that is affecting stock prices in India is something called momentum–the tendency for prices to be higher today just because they were higher yesterday than the day before and so on. The vast majority of speculators use some form of technical analysis ( based on charts ) to trade. These technical analysis strategies use price history to extrapolate future price trends. While there is no empirical evidence to support that these strategies work, the fact is that the vast majority of speculators use them because they are easy to use and software to calculate moving averages, trends, etc. are readily available. And since a large number of people use the same information it leads to bias. If everyone buys expecting the price to rise, the buying pressure itself causes the price to rise–a self-fulfilling prophecy. The Indian stock market shows signs of momentum. The autocorrelation ( correlation between prices on consecutive days) is positive and statistically significant up to a lag of 3 days. In layman terms, this means that most players in the market follow momentum-based strategies by watching daily prices and betting on the hot hand. As a consequence, prices of stocks that are rising go up even more. Now let’s put all this information together. Is the Indian market overvalued? The P/E multiple would suggest that it is. The current P/E multiple of 25 far exceeds the twenty-year average of 15. The P/E ratio is the price per share divided by the earnings per share. There could be two reasons for a high P/E multiple: one that the price ( the numerator) is high or two, that earnings ( the denominator) are low. I believe that the P/E multiple is high not because prices are unreasonably high but because earnings expectations are low. Over the long run, stock prices should increase at roughly the rate of nominal GDP growth ( real GDP + inflation). In India, stock prices have increased by around 9% per year over the last ten years. This is in line with nominal GDP growth of around 8.8% over this period. This does not suggest a market in which prices have run too far away from the fundamentals or a market which is overheated. If the Indian economy keeps growing at around 7% ( in real terms) and wholesale inflation is around 2% there is no reason that stock prices should not continue rising at around 9% annually. Liquidity and momentum are also both supportive of higher prices. There is no reason to expect that global markets will become competitive and that foreign investors would abandon India anytime soon. Another 20% increase in the market over the next 2- 3 years is, therefore, not out of the realm of possibility. But I would hedge my stock positions by buying three-month out index put options as insurance and roll them over continuously. Also, any sign of foreign money leaving as would happen if yields worldwide improved or there was a sharp decline in the rupee, would be a warning sign to sell.